All of our doorbells are wired and work with existing wired doorbell systems. If you are installing a brand new doorbell system, you will need the wired doorbell button, a wired chime, a transformer and a bell wire. We sell only the wired doorbell button. We do not provide installation advice as we do not have any qualified professionals on staff to do so. Please contact a professional in your area for the requirements that your house may need. Click here for our Installation Tips. CAUTION - We do not have any qualified professionals on staff to provide installation advice. Please contact a professional in your area for the requirements that your house may need. 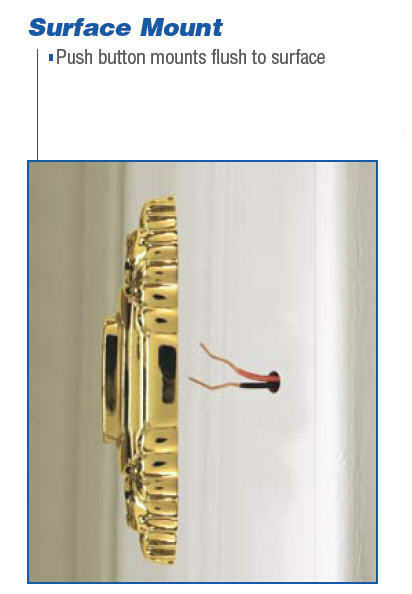 The normal use of our LED push buttons on our Solid Brass doorbells are 3W hours (30,000 hours). Our doorbells are recommended for use with up to 24-Volt transformers. If they are needed, diodes come with the chimes, not the button. If you have an older chime, it may need a diode. The diode gets installed on the two screws on the button along with the wires. It allows the electrical signal to last a bit longer when the button is pressed, which is what some old chimes need. We do not sell diodes. At the end of 2015, the Doorbell Factory company went out of business and the domain name only (website link only -> www.doorbellfactory.com) was acquired by waterwood.net. We do not have access to Doorbell Factory orders prior to 2016. All of our doorbells are wired doorbells. They are compatible with wired systems and they are also compatible with any wireless system that converts a wired doorbell to a wireless doorbell. Honeywell makes a wireless converter system that allows you to convert your wired doorbell button into a wireless doorbell button. You can purchase a nice decorative doorbell from us and then purchase the Honeywell wireless converter and compatible wireless chime to convert it to wireless! Click here to learn more. 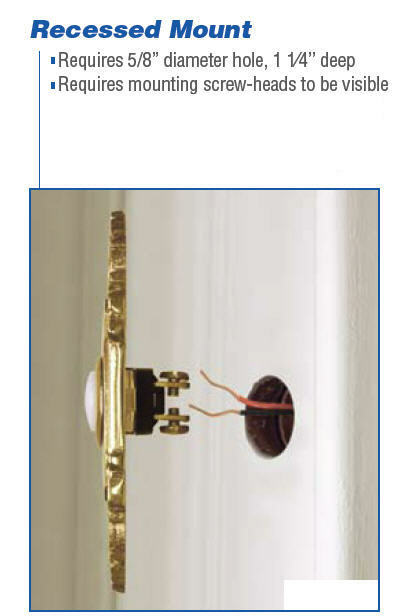 The majority of the items on our website are recessed (see diagram below) and do not mount flush to the wall. Click here for all of our surface mount doorbells. Since our doorbells are handcrafted, screw hole distance can vary slightly from one item to another, even though it is the same design. We have found that it is very challenging to find a doorbell with the exact screw hole distance of an existing doorbell. Please email us at info@waterwood.net and we can provide the approximate screw hole distance for any of our doorbells. We do not make custom doorbells at this time, however we offer many unique designs and many have multiple finish options. Our solid brass and stainless steel doorbells will not rust. First: find the electrical breaker that powers the doorbell system and switch it off. Next, remove the screws from the old doorbell cover and gently pull it away from the wall. Remove the two wires coming out from the wall from the two screws on the back of the old button. Check to see if the exposed parts of the wires are clean and not brittle. If not, simply reattach the wires to the two screws on your new doorbell button. If the wires look dirty, rusted or brittle, cut the exposed part off and strip approximately ½ inch of each wire and then attach to the screws. It doesn’t matter which wire goes on which screw. Lastly, screw the new doorbell cover to the wall.